Summary: Can you imagine visiting an island in South India? Yes, this is possible as the Guntur District has one such island. 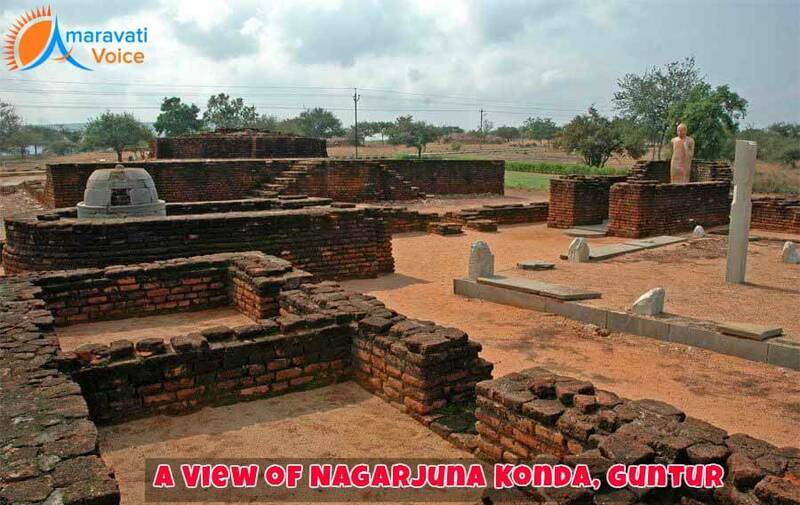 Let us explore some details about this island called as Nagarjunakonda. The term Nagarjunakonda is translated as Nagarjuna Hill and it is nothing, but a historical Buddhist town. It is now an island that is located close to the Nagarjuna Sagar in the Guntur District of the state of AP. The ancient remains of this site, which is located at a distance of about 150 kms southeast of Hyderabad were discovered in the year 1926. Before the year 1953, two major excavations were carried out in this place. The first excavation was done when it was announced that the area would be flooded by the Nagarjuna Sagar Reservoir. It was presumed that the major flood would arise as a result of the massive hydroelectric project that was initiated in the area in the year 1960. To protect the Buddhist remains in this area, a massive excavation work was carried out, during which the unearthing of many Buddhist stupas, ruins, viharas, chaityas and mandapams happened. During the period, many white marble depictions explaining the life of Gautam Buddha were found. From the remains found during the excavation, some of them were moved to Nagarjunakonda Island that now has a museum for showcasing these remains from Buddhist period to the tourists. This island was one of the most important and largest Buddhist centers in entire South India right from the second century BC until the third century AD. This place was named after Acharya Nagarjuna, who was a renowned Buddhist philosopher and scholar and who is also considered as the pioneer to spread Buddhism in this region. It is stated that he had migrated to this place from Amaravati for spreading the message of Gautam Buddha of brotherhood and universal peace. Acharya Nagarjuna as he was popularly called is the founder of Mahayana Buddhism and there is also a university that functions even today in the name of this Acharya. He also established the Madhyamika School for which students from different countries of the world like China and Sri Lanka were attracted to learn the preaching of Gautam Buddha. The Acharya also governed the community of Buddhist Priests for nearly 60 years during the 2nd Century AD. The museum was actually established with a view to collect, safeguard and exhibit the remains that were retrieved when the excavation was done near Nagarunjasagar. The special thing about this museum is that it is constructed in the style of Buddha Vihara and it is located in the middle of the remains of the defence that took place in the medieval period. Besides the remains of the Buddha reign, the museum also showcases the remains of many cultural periods that the region has passed through. Some of the articles displayed in the five galleries functioning in the museum include inscriptions, sculptures, lime stone slabs and many such things that are known to be remains from 3rd or 4th century AD. Among the galleries functioning in this area, the key gallery is known to have the masterpieces of Ishvaku dynasty, who ruled this area between 225 AD and 325 AD. In addition, there is a separate section that shows the development of human civilization in the region right from the Stone Age to the megalithic period. There are coins and seals of the ruling dynasties among the many other things that people used during those historical periods. Besides reaching this island by boat from the Nagarjuna Sagar Dam, the other attractions for tourists visiting this place are the Ethipothala waterfalls, Nagarjunakonda caves and of course the Nagarjunakonda Dam. Apart from these attractions, the Rajiv Gandhi Wildlife Museum is yet another place, where the tourists can find some dreadful animals, some rare birds and many playful animals. The best time to visit this region is from October to March every year. The museum will be kept open from 9am to 4pm for the tourists to visit. It will be closed on Friday and only a meagre fee is collected as entry ticket. Children under 15 years of age are allowed to enter fee. If you wish to explore about Buddhism to certain extent and the great life history of Gautam Buddha and if you have interest towards historical remains, never forget to plan your visit to this place during your vacation.